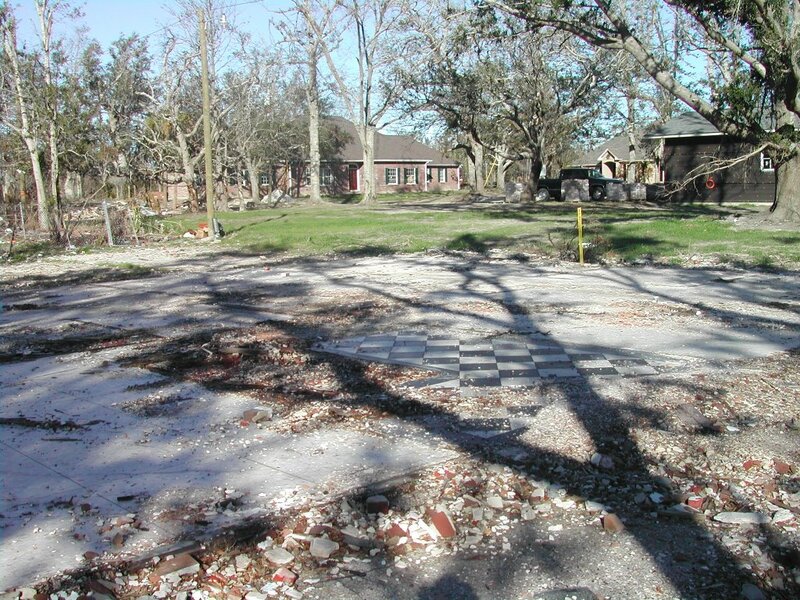 “Well, you’ll never be able to bring your kids back here and show them where you grew up,” my mom informed me, stating the obvious as we stood on the slab that was my childhood home before Hurricane Katrina swallowed the structure whole on the morning of Aug. 29, 2005. By this point almost five months later, my mom is pretty stoic in the face of twisted steel and concrete, having seen her own current home go under eight feet of water and come out looking pretty soggy, but not a total loss. This was my first visit home to Gulfport, MS, since the storm changed the landscape of my childhood forever, and I was still struggling to assimilate my emotions in the face of such total devastation. Five days of traveling from one end of the Mississippi Gulf Coast to the other and across Lake Pontchartrain to my adopted home city of New Orleans, where I lived from 1987 – 1998, left me numb with disbelief and guilt. The conditions remain appalling by most modern standards, and rebuilding remains a hope for the future as residents of both states continue to clear debris and struggle with the question of just how to make a start in tackling the enormous problems that lie ahead. Along the Mississippi Coast and the shores of Lake Pontchartrain and Lake Borgne, the images leave little to the imagination. High winds and powerful waves literally shredded mile after mile of coastline. Now, residents are faced with the daunting question of whether to rebuild and face possible destruction again or to move to higher and dryer ground. South of Lake Pontchartrain, New Orleans appears listless. The city is still standing but soggy. Many neighborhoods including Lakeview, Gentilly and New Orleans East look like they are about to collapse long after the floodwaters have receded. Levee breaches in New Orleans ultimately flooded over 80% of the city, in some places for more than a month. The presence of mission groups – mostly Christians with a smattering of other faiths – is felt strongly across the storm zone from a massive impromptu city called Project Hope set up at the western end of Waveland, MS, by the Morrell Foundation to a much smaller enclave of tents in the Ninth Ward of New Orleans along South Claiborne. In fact, missionary groups are everywhere from the joint brigade of Lutherans and Episcopalians who flew out with me after a week on the Coast to the Mennonites who quietly invaded neighborhoods in the post-storm period to help out with a universe of clean up and repair tasks to the Southern Baptist providing help and food in all their evangelical glory. Meanwhile, we are on a mission of our own to get my sister a graphing calculator for Calculus class (she was forced to transfer colleges by Katrina) when we encounter evidence of another group making a difference in the storm damaged areas: Mexican workers who have arrived to be part of the rebuilding. It’s Saturday night in Wal-Mart, and a line of young men are waiting to utilize the Biloxi store’s newest offering, announced by the sign hanging over the customer service desk, “International Currency Transfer.” Elsewhere in the store, Hispanic men mill around in groups of three and four, casually sifting through a bin of discount DVDs or picking up a package of corn tortillas prominently displayed at the end of a main aisle near the bank of cash registers. “I don't know what we would do without them,” one Coast resident says enthusiastically about the influx of new manual labor to the area. According to the lead story in the January 20 edition of the New Orleans Times Picayune, more than 100,000 of the homes destroyed were without flood insurance, and those homeowners are all hoping to get their share of more than $10 billion in federal grant money that has been set aside by Congress for rebuilding these properties. But as of this writing, that money is still an academic reality, and the FEMA funds that many have been living on for the past months will soon be coming to an end. In the meantime, there is considerable tension, even between survivors across state lines. Residents of Louisiana are want to see the problems of Mississippi in anything other than a secondary light, even though the storm itself made landfall along the Magnolia state’s shores. Meanwhile, Mississippians are resentful of the national media spotlight that has focused almost exclusively on the Crescent City, where flooding was caused by the failure of inadequate levees in the aftermath of the storm and not Katrina’s immediate assault of wind and waves. “Louisiana officials say that getting 54% of the Community Development Block Grant money – the most it can get under law – is nowhere near enough for the level of damage to homes, schools, hospitals and businesses, which they say far overshadows the destruction in Mississippi and the other Gulf Coast states,” the Times Picayune story informed. Most of the people I met during my days along the Coast and in New Orleans, were deeply ambivalent when quizzed about the response to Katrina’s devastation. People are good, but officialdom and government institutions are inept at best and more likely malicious and uncaring, they seemed to be saying. Everyone you meet has a story of how some person, or group of people, came to their aid, helping them out when they most needed assistance. For my mom, it was a group of traveling Mennonite missionaries, who removed fallen trees and helped clean out her water soaked house. For others, it was neighbors or even strangers who had something to offer at their most desperate hour. The tone of the conversation shifts when locals begin talking about their insurance company or FEMA and other governmental agencies. Most people are angry with and fearful, even paranoid, of these groups and their intentions. This tension is made more pronounced when the political aspects of the catastrophe are brought into focus. Largely Republican South Mississippi faced its fare share of post Katrina challenges, but they seem to pale in comparison to the levee failures and public fiascos that have transpired across the Mississippi River in Louisiana. “What happened in Louisiana was a man-made disaster,” declared Loyola University professor and New York Times columnist John Biguenet at a politically charged panel discussion on preserving New Orleans culture held at the school in middle January. “An agency of the U.S. government, the Army Corps of Engineers, did this to us." 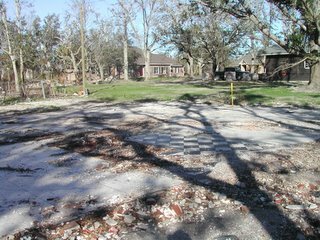 The destruction in dollars and cents may, in Louisiana, far outpace the more visually disturbing scenes one finds along the Mississippi, especially in Waveland where an entire beachfront town has been all but obliterated. However, the loss of a quintessentially coastal culture, blending French, Spanish and African and Native American heritage in a special southern gumbo, is beyond measure in both states. For many, like myself, this question of cultural preservation looms as large as the rebuilding of homes, businesses and economies. As much-need new capital flows into the region, what effect will that have on a part of the nation largely resistant, until now, to the national consumer brands that have taken over so much of the rest of this country? Just like that childhood home that my kids will never see, the rebuilding of the Gulf Coast will result in a new and different community, and some of what was best about the old is sure to slip through the cracks of redevelopment. During their presentation to a packed house at Loyola University in New Orleans, Biguenet and his fellow panelists made the case that traditional culture was already in danger before the storm. A disaster like Katrina, they said, can serve to either speed that process or provide local residents with an opportunity to save what is unique about where they live and work. Times Picayune columnist Lolis Eric Elie worried that the new New Orleans, which will emerge as a result of rebuilding, would represent a more corporate, market-driven place that had no room for many of the city’s old school charms. “It’s hard to sew an Indian suit all year if you are trying to make VP at the local bank or partner of your law firm,” he said, referring to the age old folk tradition of so-called Mardi Gras Indians that parade each year in hand-made Native American garb during Mardi Gras. At the center of many cultural traditions in New Orleans and along the Gulf Coast, even Mardi Gras itself has become controversial – whether to have it or not in the face of so many other public challenges. That seems to sum up the attitude of many locals, prominent or otherwise. New Orleans and the Gulf Coast have a rich cultural tradition; of that there is little argument from any quarter. Moreover, the defenders of this unique region have a grand opportunity to make “sweet usage of adversity” in saving what is best while improving upon the seemingly impenetrable problems of poverty, racial tension and some of the worst public schools in the U.S. In their own intensely civil and charming way, locals in New Orleans and along the Gulf Coast are having a boisterous conversation about what their new community will look like. And the loudest voices appear to be saying that they want to get back what was theirs before Katrina, in all its deeply flawed glory. During my own tour around town with New Orleans native and local filmmaker Henry Griffin, we paused on Magazine Street to visit two different businesses in the same city block. One is an upscale jewelry store, Katy Beh Contemporary Jewelry, started by an Iowa transplant who fell in love with New Orleans and plans to stay even after the storm. The other is a shoe repair shop, Edwards Shoe Service, which predates Magazine Street gentrification by decades. I’m a student at Elon University working on a project about radio during Hurricane Katrina. I was wondering if you could recall any specific use of radio before, during and after Katrina and how important radio was in the overall event. Do you remember any of the callers? Also, I was wondering if you know of anyone who I could talk to? All help would be greatly appreciated.